The food was presented very well as it looked really appetizing. The portion size was fair and was a decent amount of food for two people, appropriate for a midday snack. The cones were placed in a nice tray with holes for the cones to sit in, perfectly positioned for photos. We first tasted the Kickin’ Ranch, which was not our favorite. It was a little spicy and didn’t taste much like ranch. It was better with the cone as the cone added a flavor contrast. Then we tried the Buffalo Blue. Morgan thought this was very similar to the Kickin’ Ranch because both were spicy and didn’t have a unique flavor. However, Bella thought it tasted good and definitely was better than the Kickin’ Ranch because it was similar to boneless buffalo wings and went well with the cone. Next up was the Yella BBQ, and this one was the best one by far. If either of us would get a whole cone, we would choose the Yella BBQ because the sauce tasted great and went with the cone as well as with the chicken, together creating a supreme palette of sweet and savory. The sauce itself was a good texture and thickness to go with the chicken so it wasn’t overpowering but was still flavorful. Finally, we tried the Cinna-Maple, which Morgan liked because she is a fan of cinnamon and syrup; however, the syrup was thin and pooled at the bottom of the cone instead of totally sticking to the chicken, leaving it a bit dry. 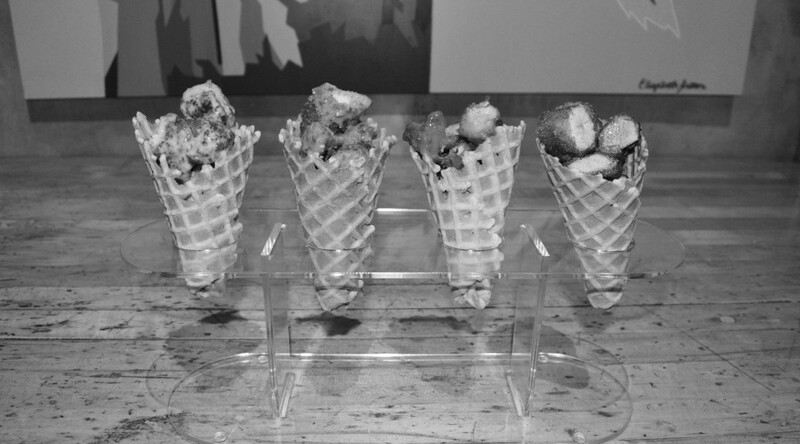 Bella did not like the Cinna-Maple because it was too sweet and in combination with the sweet waffle cone just made the chicken seem out of place and created a too-sweet savory snack. At the end, we did agree that the cones themselves were not impressive and didn’t taste fresh, they were thin and crispy. If the cones were a bit softer, it would have been a better eating experience because it would provide a nice texture difference against the fried chicken. But the fork-free aspect did work, surprisingly, and it was pretty easy and enjoyable to eat without creating that much of a mess (except for the Cinna-Maple one which was pretty sticky and had liquid syrup pour out at the last bite). Gansevoort Market at 353 W. 14th St.